Property 5: 4 Season Cottage at Lake Vernon - Perfect for families! Property 7: Family Friendly Cottage on a Small Quiet Lake Minutes From Huntsville. Property 13: Beautiful Waterfront Suite with lots of room for you! Property 16: Centre of town; in the middle of all the action. Gorgeous intown home. Property 20: Lake Muskoka year round cottage rental with 300' of waterfront. Property 38: Big Beautiful Cottage on Lake Muskoka! Property 41: Spacious Family Friendly Cottage On Lake Mckechnie! 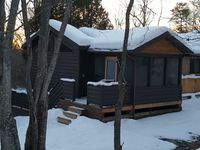 Property 42: The Gryffin Suite- Huntsville Ontario! (Muskoka) Sleeps 2 adults and 2 children.